To be able to operate as a versatile wedding planner, a wedding professional, service provider or an events specialist nowadays, it’s imperative that these professionals become familiar with wedding traditions and customs of different cultures and nationalities, so they are able to close the deal, meet or exceed their clients’ expectations and expand their business. Whether a planner is based in a multicultural city such as Dubai or meeting international clients at home or abroad, her/she is bound to deal with clients of different cultures, nationalities and ethnicities. WEDDING BONANZA will help these professionals understand the differences and similarities of multi cultural weddings, and offer them a great opportunity to learn the best practices and the dos and don'ts of planning a wide variety of weddings, be it Arab weddings, Indian weddings, Turkish, Iranian, European or African weddings. Planning ‘Women Only’ Weddings - A practical experience of planning Saudi ‘women only’ weddings and differences among GCC traditional weddings from a non-Arab perspective. Wedding Traditions of Eastern Europe - A walkthrough the main wedding traditions of Ukraine and other Russian speaking countries. Understanding Iranian Wedding Traditions & Customs - From Hanna Bandan to Sofreh Aghd, you’ll get to learn about what it takes to plan an Iranian/Persian wedding. Gulf Wedding Customs & Traditions - What you need to know about planning weddings for Gulf families in Bahrain, Saudi Arabia and elsewhere. 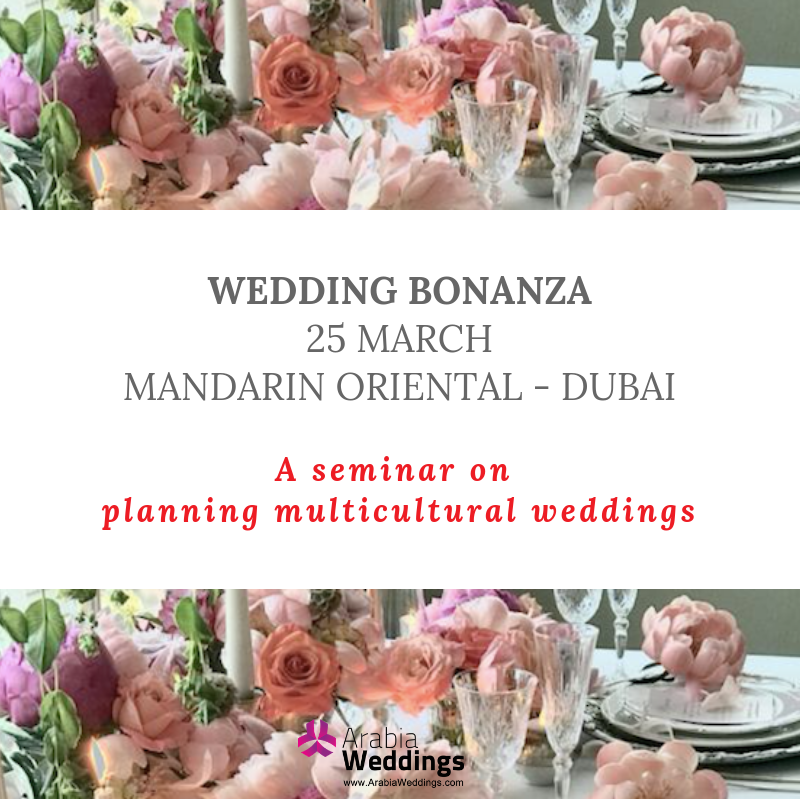 WEDDING BONANZA is a one-day Seminar that will be held on Monday, 25 March at Mandarin Oriental Jumeira, a stunning new beachfront 5-star hotel in Dubai. "Having worked with Arabia Weddings on several workshops and classes, I cannot thank Samar enough for all that she does to bring our industry together. Arabia Weddings has been a great platform for the regional and local industry to exchange ideas, inspire and motivate" said Zainab Alsalih, Founder of Carousel - aluxury wedding planning company based in Dubai. Rahul Kumar of Vivaah Weddings - a specialised wedding planning company in Indian weddings said "This seminar is an informative platform for the next generation of aspiring event planners as well as existing event professionals who are looking at an introduction into different cultures and ethnicities. Having spoken at the previous version hosted by Arabia Weddings, I must say this one is not to be missed." To register for the event follow the link to WEDDING BONANZA - a seminar on planning multicultural weddings.